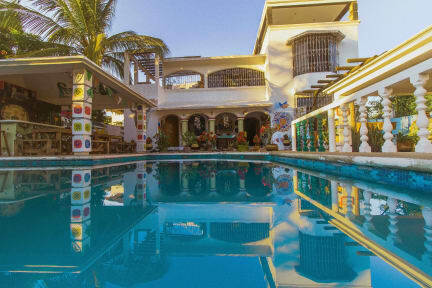 NOW FULLY AIR CONDITIONED and climate controlled private rooms and dorms set in a spacious villa with high ceilings and large open areas, when you arrive at Vivo Escondido you step into the ultimate holiday home by the beach. We welcome you with open arms and friendly smiles to join our little family and explore the beauty and magic of Puerto Escondido. Laze in the hammocks or practice yoga on the roof terrace, as the breeze from the ocean washes over you. Play a round of table tennis, have a beer by the pool, watch the sunset from the rooftop, cook your favourite meals in our fully equipped kitchen or just explore all the different art and murals covering our walls. We provide the perfect setting to interact with other guests and make friends for life. We are close to the best swimming beaches of Puerto Escondido and a 5 minute walk from the beginner/intermediate break at Playa Carrizalillo. As well as homemade breakfast, you can enjoy great restaurants nearby ranging from Middle Eastern cuisine to seafood straight from the ocean, to pizza and even sushi. Come with an open mind and you will leave with a full heart, new friends, and a promise to return to your home away from home. Reception opened from 7am to 11pm.